Congratulations to some of our newly Certified Municipal Clerks (CCAC Annual Conference)! 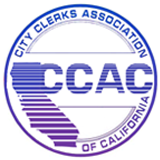 The City Clerks Association of California (CCAC) was founded in 1977 with the objective of promoting the City Clerk profession throughout the State of California. Promote the interests of City Clerks. Promote professional administration and education of City Clerks' offices. Promote uniform standards for administering City Clerk duties. Promote improved standards of efficiency for City Clerks. Promote better municipal government through increased cooperation with other municipal officials. Promote legislation which supports the goals and objectives of the organization.